With nothing to do all weekend we pretty much lazed around the convent all day and thought about what to eat for lunch, dinner, etc. Jen, Witt, and Vicky went shopping in the morning. The only meat they could find (that looked any good and was reasonably priced) was 10kg of frozen chicken legs imported from the USA. It seems we can’t escape hormone-fed meat even in Africa. Lacking anything better to do and having several members of our group who are obsessed with food, we spend a lot of time thinking about food, planning meals, and cooking. This evening we made pizzas with tomato sauce, curried chicken, banana, and La Vache Qui Rit (what we sometimes call “Laughing cow”) (a processed cheese spread that has been our constant companion from Morocco onwards) the making of which was quite an operation for nine people. Along with the pizza we had a tomato and avocado salad. Each pizza was baked over charcoal on a portable grill. They came out very nicely and we gave the nuns a taste. Not only had they never had pizza before, they didn’t know what it was! After dinner Elza brought out her laptop and we watched the French film, Delicatessen, under the stars. Another day lounging around the convent, but at least on the weekend there aren’t a million screaming kids running around. Jen went to the church service in the morning with the mother superior and two other sisters. The 3-hour Catholic Mass was held in French, Latin, and the local Congolese tribal language. As it turned out, Jen was the guest of honor and was asked to stand as the priest made a speech that she didn’t understand. Afterwards, everyone in the congregation clapped, so we can only assume that the priest said something to welcome her to their community. Or perhaps he was commenting about how unusual it is for a white person to come to their church. Either way, Jen was just a bit embarrassed about being singled out. Fortunately, everyone was very nice about it and she was suddenly on a first-name basis with a bunch of people who were eager to talk with her and shake her hand. Meanwhile, our obsession with food continues, as does our quest to eat the chicken that won’t fit in the freezer. Connie made her now-famous chicken tikka masala and we had a nice flan for desert. Hoping to finally be able to leave Matadi we arrived at the Angolan embassy at 930 with our paperwork in hand. Again we were told that the vice counsel was out at that we’d have to come back tomorrow. They told us that if we paid now things would go faster tomorrow. Reluctantly we handed over $720 for nine visas and insisted on receipts. They told us that we could come back at 10am tomorrow to collect our visas. 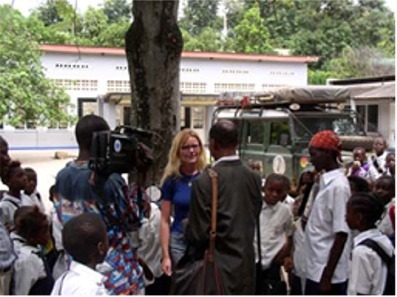 When we returned to the convent, a crew from the Congolese television station was on hand to interview us (apparently they had heard we were here.) Elza, being the only fluent French speaker among us, gave the interview with Rafiki in the background. We’re looking forward to the 1830 news broadcast this evening, when (if the electricity is on) the interview is supposed to be broadcast. Graham thinks he may have malaria and took a dose of Fansidar to try to kill it this morning. Unfortunately Fansidar pretty much knocks you out for a day, and he spent the afternoon sleeping in the tent. Clouds moved in at about 2pm and it rained heavily for about 20 minutes, just enough time for us to run around getting soaked while erecting awnings and moving our stuff under them. As promised the Congolese TV station ran the interview on the news. We all gathered with a few of the sisters and watched Elza on TV. We left for the embassy this morning at 10 am hoping to retrieve our passports. It was raining hard and we all got soaked while putting fuel in the vehicles. At the embassy we were told that we had to wait until the consul arrived. We finally got our passports back (with visas!) at 1pm. We drove the 6km to the Angolan border and checked out of DRC. The customs officer on the Angola side wasn’t there so Witt and a police official took Rafiki into town to retrieve him from his house. He was friendly and efficient and after he had stamped our carnets Witt drove him back home. The immigration officer proved to be more of a problem. He seemed to have difficulties with his arithmetic as he asked us for a $50,000 (US) bribe. We all thought this was very funny. His office was very small, and lacking anywhere else to sit Graham sat on his desk. This didn’t amuse him much, and even after Graham had apologized it took another hour until his boss arrived to settle him down enough to stamp our passports and return them to us. Meanwhile Vicki had made friends with Fifi, the wife of the local police chief. Since it was nearly 5pm we accepted her offer to camp outside her house. We set up and made dinner and afterward watched Tomorrow Never Dies with Fifi, the police chief, and their newborn son. 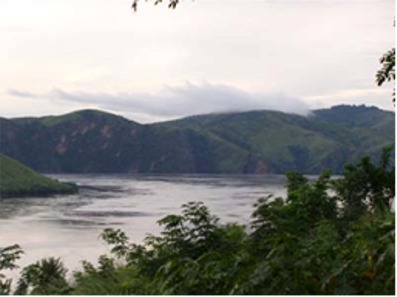 The spot where we are camped, in Fifi’s front yard, overlooks a beautiful spot on the Congo river. We watched some fishermen paddle pirogues across the river as the sun set. We have a report from another traveler who says the next stretch of road is very bad (105 km in 11 hours) and we are concerned that the rain could make conditions even more difficult. Graham spoke with his doctor this afternoon. The doctor doesn’t think he has malaria, but he’s not sure what he does have.